First the bad news - the cookhouse dinners at Kurtwood Farms will be ending soon. If you haven't had a chance to go yet, the dinners are coming to a close December 26, 2010; ending a near six year run of local, delicious food and fun. However, we'd be (understandably) selfish to just bemoan the loss without explaining why he's had to do it. 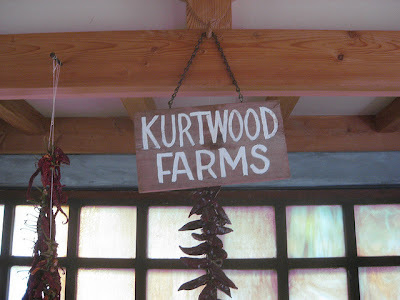 Here's where the good news comes in - Kurt's going to be busy promoting his book in 2011. Growing a Farmer has already received great advance feedback. There might even be a follow-up. In addition to the book, hopefully by now you've had a chance to sample his other passion: Dinah's Cheese. With the farm's cheese cave now completed, Kurt's been busy working on the hard cheese, Francesca's. I can't wait to try it! Congratulations Kurt and thanks for all the deliciousness!